Located eight miles north east of Great Keppel Island, Outer Rock is a large isolated rock rising up to 20 metres. There are four main area's that we dive. On the northern side is a well sheltered bay which gives protection and excellent diving. To the east, a large rock runs northwards starting at 5m (17ft) of water and decends to 18m (60ft). By following this rock around it makes for easy navigation. In the shallow water, there is an abundant supply of small coral fish. Whilst in the deeper waters, larger pelagic fish are found roaming. With lots of gutters in this area, it makes for graet exploring and you may be lucky to stumble across a large Maori Wrasse that inhabits this area. Outer Rock has some of the prettiest coral of any of our dive sites. Looking under the ledges we can sometimes find large Painted Crayfish. Man & Wife located between Outer Rock and Great Keppel Island, features a plateau near the island that is around 6 - 8m (20 - 27ft) in depth. This than drops off to a depth of 18m (60ft) around most of the island. 25m (80ft) is the maximum depth in this area. With good coral in and around 10m (30ft), it makes for nice easy diving. Along the rock face of the islands, you will find lots of different types of soft corals which make for great macro photography. Up in the gutters we find Wobbegong sharks just waiting for their chance to make the front cover of Scuba Diver magazine, by that ever keen photography. Seven miles east of Great Keppel Island are Barren & Child Islands. Diving these islands allows us to visit numerous sites ranging from 30m (100ft) off Child, to a very easy but extremely pretty area with depths of 6 - 9m (20 - 30ft) known as "One Bum Beach". A drift dive in the passage between and along the top of the islands is an experience where we find large schools of Spanish Mackerel, Tuna, Trevally, Black Kingfish and occasionally, the odd Manta Ray may be spotted. The fringing reefs of these two islands ensure an endless display of tropical fish life and spectacular colors of coral. Australia's Best Kept Secret!! - Egg Rock a site of world class diving. It is a Marine National Park "B" Zone which means that these islands are totally protected. This location is look and photograph only, and of undisturbed beauty, with wall dives to 30m (100ft) on the seaward side. Words just can't describe the numerous types of corals and fish life in this area, with some fish up to 60 - 70 kg in weight. Coral Trout in total abundance and as big as medium size Estuary Cod. 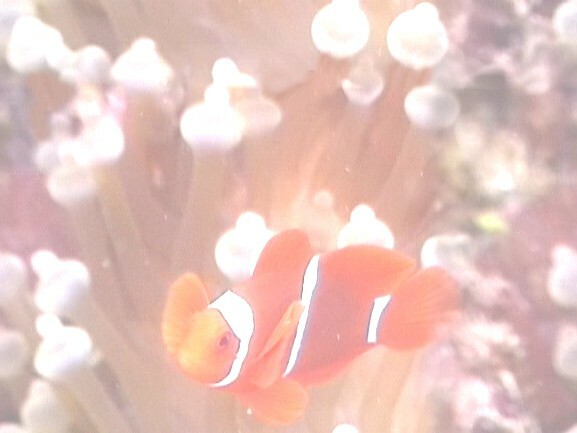 Clown Fish (the size of you hand) in their Anemones in patches up to 10m in diameter. Sea Snakes as thick as your arm, Cod as big as a diver and schools of pelagic fish constantly swimming around. Bommie's in 20m (65ft) of water attract other species of fish like Barramundi Cod, Hussar's, Sweetlip, Hump-Headed Batfish and Red Emperor just to name a few. All in all, this site is a photographers dream and for those without a camera, a dream come true location. A well sheltered bay located on the North East point of Great Keppel serves as an excellent site accessible in adverse conditions. Great for such dives as Night Diving and Drift Diving. Big Peninsula has a horse shoe shape beach with golden sands and coral gardens, which is a popular location to spend some S.I.T. and have lunch leading into our second dive. Out off the peninsula at 12 - 14m (40 - 47ft), large bull rays, numerous blue-spotted rays, sea whips and sea-cucumbers can be found, besides a resident moray eel. This makes this site a pleasant, leisurely dive.